Pastel yarn is the perfect choice for spring crochet patterns. You can use pastels to make home decor items as well as wearables for any age. Baby items always work especially well in pastels and are perfect for spring crafting. Say goodbye to winter with all sorts of pretty pastel crochet, but don't be afraid to use these patterns at other times of year as well since many of them are versatile. The patterns can also all be adapted using other colors if you don't always want to craft them in pretty pastels. 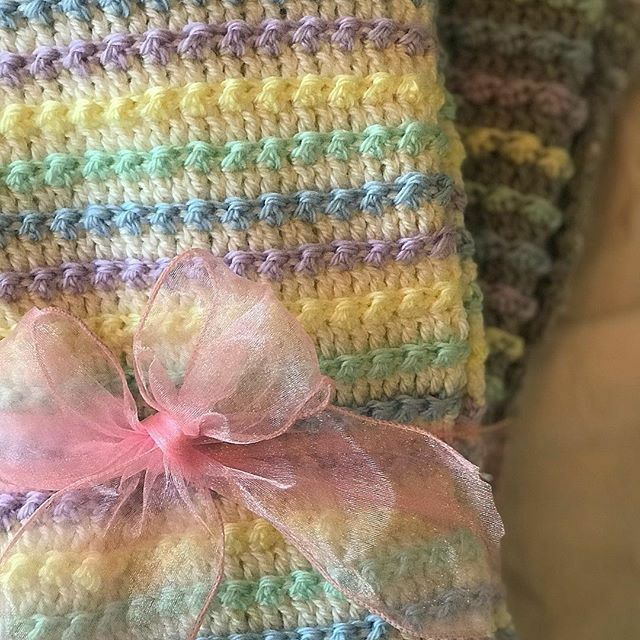 Crochet baby blankets are the perfect project for trying out pastel colors. The soft shades are ideal for a baby's nursery. There are many yarn companies that make baby yarn in pretty pastel hues. This free crochet pattern uses basic crochet stitches, particularly double crochet, sometimes worked in the back loop only for added texture. The main color of the blanket is a soft cream. The pastel colors (lilac, baby blue, yellow, and green) are added as individual rows that create cute stripes across the blanket. The yarn used for this baby blanket is a #2 fine weight yarn. This lightweight yarn is a good choice for a blanket to be used during the warmer spring and summer months. People who enjoy learning how to crochet from video tutorials will be pleased to find that Crochet Hooks You offers this body cloth in that form. This pattern uses yarn in a printed pastel color so that you can have all of the loveliness of multiple pastels without having to change yarn. This crochet pattern is easy to learn. It alternates slip stitch and half double crochet stitch. This creates a thick texture that is well-suited to the washcloth since it helps scrub softly at your skin. Add a special bar of soap to make a terrific gift. Pastel patterns don't have to be for babies or children. Select a sophisticated pastel palette for adult accessories. This free crochet scarf pattern is designed using a specific colorway of variegated yarn in chic, muted pastel shades. After completing the entire scarf, tassels are added in additional colors that you can select for pops of brightness. Tassels can be added at the top and bottom as well as at the sides. Play around with different color variations to accentuate or mute the pastels to your liking. This is a large crochet scarf measuring about 10" across and over 80" long. It is worked in half double crochet and uses the back loop only technique to create a ridged texture. What makes this scarf really unique is that it's not an exact rectangle; it comes to a point at the top and bottom and widens in the center. Pastel colors really pop when set against a neutral background. Designer Moogly was inspired by stormy days, with pops of spring flowers emerging from the grey clouds. The colors are used to create rows of a unique shell stitch that gives an undulating effect to the overall blanket design. The pastel shades are mixed in with additional colors here for a subtle effect; choose a variegated yarn in only pastels for a brighter option. This triangle scarf is made using a very lightweight wool yarn that has some nylon for stretch as well as a bit of sparkle. Let the yarn do all of the work. The result is a brightly colored pastel accessory that is just warm enough to block a little spring wind. When working with pastel yarn, it isn't necessary to use all of the different colors of the rainbow. Choose just one or two colors to highlight in a project for a more sophisticated sense of style. That's exactly what we see in this crochet cowl, which uses pastels in blue and green. This cowl is worked primarily in granny stitch, a contemporary take on the classic granny square. The top is worked in a ribbed stitch, which gives a better fit to the cowl and also adds more detail to the design. It is worked primarily in basic stitches, but you'll have the chance to practice a few uncommon stitches including dc3tog and slst2tog. Note that this is a bilingual crochet pattern. There is a link on the page to take you to the English PDF pattern. Combine soft pinks with golden yellows, add in some darker shades of pink and complement it all with neutrals. The result is a spring colored blanket made up of hexagon shapes. 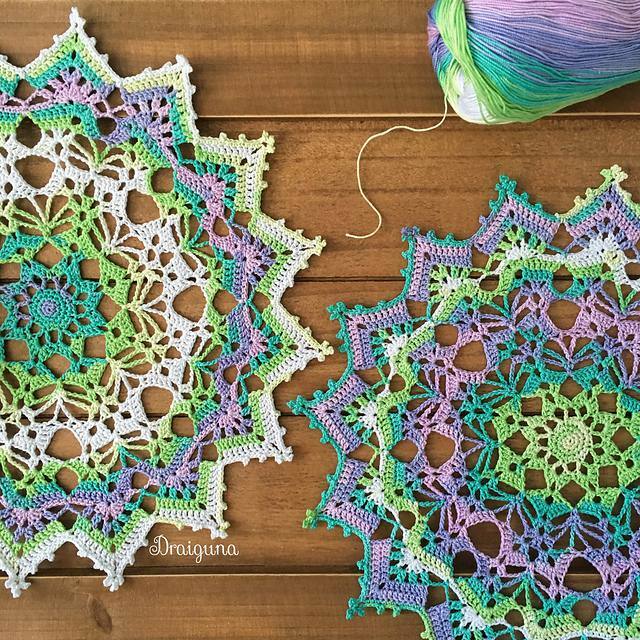 These crochet hexagons are unique in that they add spaces in the rounds to create a design that looks like dragonflies, enhancing that spring feeling. Yarn isn't your only option for making pastel crochet; crochet thread also comes in pretty pastel colors. This flowery crochet mandala is made with a variegated thread in a mixture of pastel colors. You get all of that brightness of spring and don't have to change yarn throughout the project. Use this crochet mandala to decorate your table or hang it as wall art. This crochet pouch pattern incorporates so many different pastel colors and the result is fabric that makes you feel light and happy. The pattern uses the waistcoat stitch, which many people don't know well, so it gives you the chance to try something new in crochet while working on a small project. Use it to hold sunglasses, pencils, crochet hooks, or cell phones. Don't forget about amigurumi and crochet toys when looking for pastel patterns! This bunny is ideal for a child's Easter gift but also chic enough to make adults smile. The yarn used for the body is a sophisticated cream color with pastel flecks. Pastel is then added in the clothing, flower, and bows. It's adorable at every level.